Point Pleasant senior Cason Payne (7) drags a Herbert Hoover defender during a second half run in a Week 4 football contest at OVB Field in Point Pleasant, W.Va.
Point Pleasant defenders Jovone Johnson (11), James Musgrave (13), Nick Parsons (42) and Josh Wamsley (2) combine to bring down a James Monroe ball carrier during a Week 11 football contest at OVB Field in Point Pleasant, W.Va.
POINT PLEASANT, W.Va. — This rubber game is more like a good old-fashioned grudge match. Both Point Pleasant and Mingo Central have split decisions with one another by a combined nine points over the last two seasons, and their third matchup provides even higher playing stakes on Saturday during a 2018 Class AA opening round playoff contest at Ohio Valley Bank Track and Field in Mason County. The eighth-seeded Big Blacks (8-1) and ninth-seeded Miners (8-2) have provided a pair of instant classics in their recent head-to-head bouts, which happened to be the 2017 and 2018 regular season openers for each program. MCHS — as defending Class AA state champions — used a 31-yard Hail Mary pass from Jeremy Dillon to Dawson Elia with no time remaining in regulation to snap Point’s then state-best 43-game regular season winning streak with a dramatic 36-34 decision in the 2017 opener at OVB Field. This fall, the Big Blacks got a little revenge by scoring 14 unanswered points in the final 16 minutes of regulation while knocking off the host Miners by a 42-35 count in Delbarton. That is the brief history between these two programs, with each game going in favor of the road team. The two schools, however, do have some similar history in regards to the postseason. 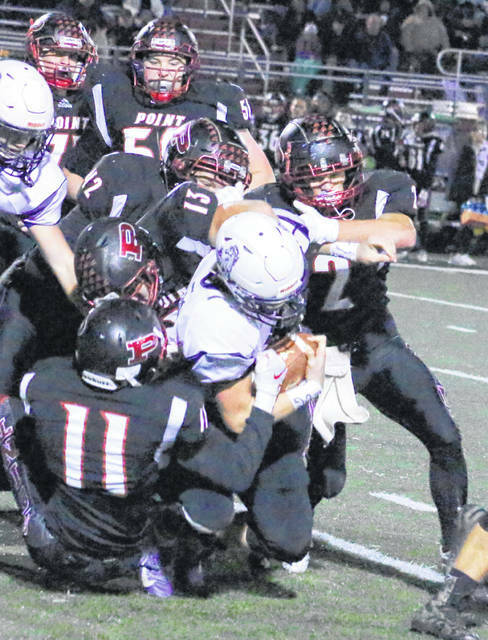 Point Pleasant is hosting a playoff game for a sixth straight year as part of qualifying for its 11th consecutive postseason appearance and 16th overall. The Big Blacks have won their last five opening-round playoff contests. Mingo Central — which has been in at least the state semifinals each of the past three years — is making its seventh consecutive postseason appearance and is unbeaten in its last four opening-round games. Something will have to give in this third gridiron matchup, which should prove to be more of a gem than a charm. Point Pleasant is also 5-0 in Saturday afternoon games at OVB Field, with the last one coming during a 38-20 victory over Jefferson in the opening round of the 2014 Class AAA playoffs. 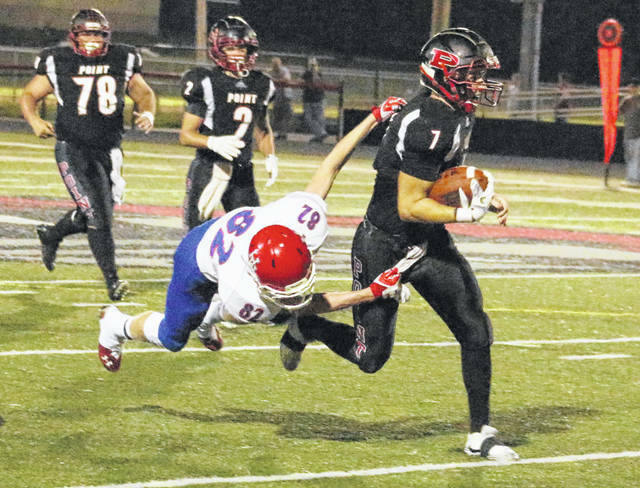 PPHS football coach David Darst believes that first-hand knowledge of both the adversary and the task at hand are good motivators headed into the playoff opener. He also notes that it’s going to take 48 minutes of quality football — and having the 12th man behind them shouldn’t hurt the cause. “I think that it is to our advantage that this game is at home and it’s someone we are familiar with. Mingo Central is a really tough opponent, so I don’t think that our kids will be coming in taking this one too lightly. We all know better than that with this opponent,” Darst said. “Our challenge is finding that energy level that we had in the first half against Spring Valley and sustaining it for 48 minutes. That football team is good enough to beat anybody in the state in double-AA, not just Point Pleasant, so we really have to be at our best if we want to move on. The Miners enter Saturday averaging 45.4 points and 464 yards of total offense per game, including an aerial assault that churns out just a shade over 302 yards an outing. MCHS did not attempt a single field goal in 10 regular season games and went 22-of-33 on extra-point kicks. The Black and Sky Blue have surrendered 25.5 points and 356 yards per game defensively. The Miners are plus-5 in turnover differential and have held three opponents to single digits this fall, but do not have a shutout to their credit. Sophomore quarterback Daylin Goad leads the potent offensive attack after completing 162-of-229 passes for 2,982 yards for 44 touchdowns and eight interceptions. Goad is also the team’s No. 2 rusher with 443 yards and nine scores on 101 carries. Junior Dougie Dillon leads the rushing attack with 739 yards and five TDs on 107 carries. Junior Drew Hatfield has 15 attempts for 206 yards and two scores, while junior Zach Patrick has 13 totes for 132 yards and four scores. Mingo Central has 11 different receivers with at least one catch this season, with six of those coming up with at least nine receptions. Drew Hatfield leads the receivers with 72 catches for 1,260 yards and 19 touchdowns. Freshman Devin Hatfield is next with 45 catches for 772 yards and seven scores, while senior Billy Mitchem has 18 grabs for 450 yards and nine scores. The Big Blacks enter Saturday averaging 48.9 points and 467 yards of total offense per contest, including 299.9 rushing yards each game. Point has converted two field goals and 42-of-52 extra-point kicks this fall. Senior Cason Payne has completed 104-of-154 passes for 1,369 yards, throwing 16 touchdowns and only three interceptions. Payne is also the team’s leading rusher with 939 yards and 16 scores on 107 attempts. Junior Brady Adkins joins Payne in the backfield with 104 carries for 899 yards and a dozen scores. Senior Josh Wamsley leads the wideouts with 39 catches for 478 yards and eight touchdowns. The Red and Black have surrendered 19.3 points and 279 yards per game defensively. The Big Blacks are plus-3 in turnover differential and have held four opponents to single digits this fall, including shutouts over Warren and Man. Point Pleasant has surrendered only 13 first quarter points and has outscored opponents by a 291-76 margin before halftime. PPHS also has two defensive touchdowns and a pair of special teams touchdowns this fall. Darst notes that all things being equal, the outcome might simply come down to veteran leadership — something that the 12th-year mentor believes to be in his favor. He really wants to send this senior group out with a victory in their final game at OVB Field. He also knows it will take a monumental effort to accomplish that feat. “They (Mingo Central) are well-coached and they have some really outstanding skill players. We are going to have to know where those players are because if we don’t, they are going to hurt us,” Darst said. “I feel like we have some advantages up front and on the defensive side, but it’s going to take everyone playing at a high level for us to move on. Kickoff is slated for 1:30 p.m. Saturday.